Admissions have been announced for undergraduate, graduate, postgraduate, MPhil and Ph.D. programs in FAST National University of Computer & Emerging Sciences Karachi 2018 which is the top-ranked school of higher education in (Higher Education Commission) HEC Universities ranking 2018. This academic institute of learning in Pakistan has become synonymous with conveying quality education and conducting research on recent cutting-edge technologies. Fast University Karachi is running its other campuses in Lahore, Islamabad, Peshawar University Campus, Faisalabad, and Chiniot campus. The institute’s motive is to become a prestigious and a high ranked university in the global arena. Below we are going to show you admission details along with fast university eligibility, Fee Structure, courses outline, admission last date and Fast University of Karachi job 2018. 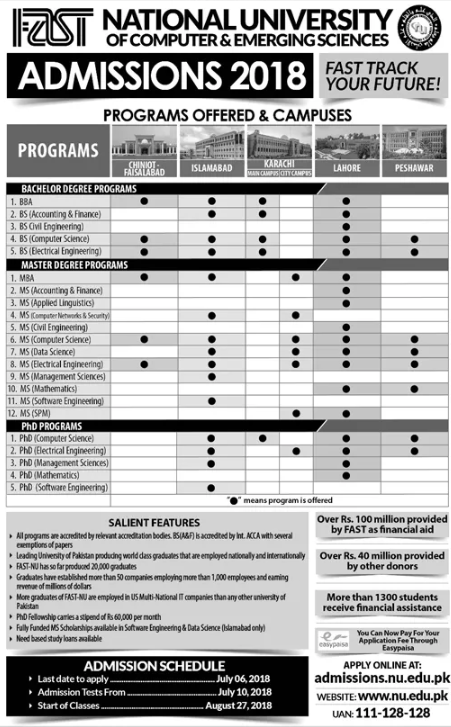 Admissions are open in fast University Karachi BBA Business department, BS Economics, Computer science, Software Engineering, MBA, MS and Doctorate levels. Move downward to find the last date of entry test, admission form submission, jobs, scholarships and more about updated admission information. Fast University Karachi Admission Test 2018 Last Date. Application submission last date (BBA, MBA, MS, Ph.D.): Jul 2nd – July 6th, 2018. Admission Tests for BBA & BS: From 10th July, 2018. Admission Tests for MBA, MS & Ph.D.: From Jul 17th, 2018. The Fee structure for fast Karachi university session 2018 in FNUCES will be charged 15,000/- rupees at the time of admission for BBA and BS programs. The tuition fee of Rs. 81,000/- will cast every semester and for Postgraduate and Ph.D. levels, the students will submit 63,000/- rupees for tuition and 15,000/- on admission. For more details click at this link. This well-reputed institute of learning is announcing admission for undergraduate programs in several disciplines. Where they will get a quality education by highly qualified professionals and world-renowned teachers. The students can submit their application forms in any of these subjects including BBA, BS Computer Science, BS Electrical Engineering, BS IT and BS Economics. Those candidates have passed their HSSC Intermediate Examination with the 2nd division from any registered board can apply for these programs except BS Electrical science. Where only those applicants who are having FSC (Pre-Engineering) or engineering course equal to FSC, are eligible to apply for BS Electrical science. Get admission in FNUCES in various programs offered by the institute as you can be enrolled yourselves in the desirous programs like MBA (Masters of Business Administration), MS (Computer Science & Software Engineering) and MS (Electrical Engineering). The students are going to join course of MBA, they have completed 14 years of education with must be second division in graduate degree which passed by recognized college or university of the country, for MS computer science program the students who owns BS (Hons.) four years program with minimum 3 CGPA out of 4, and BS Electrical science four years programs is compulsory to get admission in MS Electrical sciences. The applicants should visit the city campus admission office, along with the original and copies of educational documents. The application processing fee 1000/- rupee, this fee includes admission test fee and entry test fee. Additional fee of Rs. 500/- is payable for each admission test as entry test for MS programs. The forms should be submitted to the admission office before the last date otherwise forms would be rejected. To expand its well reputed faculty, Fast national university is looking for qualified experienced and enthusiastic individuals. Fulfilling various seats as a lecturer, assistant, associate professors and nonteaching staff like as clerk, administer etc. When updated scholarship criteria programme please inform me. I am from kohat city and can’t visit the city campus. UPDATE ME ABOUT UNDER GRADUATE ECONOMIC COURSE AND SUBJECTS AND ALSO ABOUT ITS PROCEDURE.